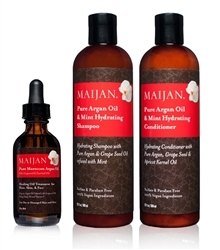 Description: The Maijan Pure Argan Oil & Mint Hydrating Conditioner will help solve your number one hair concern, dry, damaged and frizzy hair. Formulated with Argan, Grapeseed, and Apricot Kernel Oil, this sulfate and paraben free Argan oil conditioner bonds with each individual hair strand from root to tip, creating a protective coating that lasts between washes leaving hair shiny, bouncy and silky soft. This unique antioxidant and vitamin enriched argan conditioner formula utilizes innovative Argan & Grapeseed oil to nourish the follicles and restore the scalp and hair to a healthy state. A blend of natural oils protect hair from daily damage including everyday styling, blow-drying and flat ironing, while providing core strength for maximum elasticity and shine. Feel: This shampoo and conditioner duo is jam packed with all the same essential oils as our beloved Maijan Oil giving it the same smooth and luxurious feeling as the argan oil does. Scent: Includes pure Argan Oil, Grapeseed Oil, and Apricot Kernel Oil and a subtle hint of mint. I’m obsessed with the scent of this product! The light apricot fragrance isn’t overwhelming and is extremely soothing. This is definitely a pamper-yourself product! Usage: I used about a quarter sized amount of each product and that was just enough to produce the perfect amount of lather to make my hair feel clean and just the right amount of conditioner to leave my hair feeling soft, shiny, and hydrated! Results: I LOVE these two products! I love the scent and how it lasts almost all day long on my hair! The product left my hair super manageable and I was able to use it before letting my hair air-dry curly and before straightening and my hair looked fabulous both ways! This is definitely a must-have product and I will definitely be using these products again! ← Thermal Wraps vs. Foils for Highlights — What’s the Difference? !